Brainiac 5 has cracked the Fatal Five computer system and arranges for the Legion to intercept an attack on a recycling planet. Collating data he has deduced their plan. Curiously, however, the Fatal Five pound the Legion knocking Saturn Girl into a coma-esque sleep and then... leave. After a heart to heart with Clark, Brainy decides to return to Colu to retake his aptitude test. The core members join him on a field trip to meet his old tutor Dr. Mod. The Legion are surprised that the planet isn't like post-crisis Krypton. Everyone is happy, full of life and vigour as apposed to cold, emotionless and detached. Phantom Girl tries to be supportive of her friend however only succeeds in interrupting his studies and frustrating him into relinquishing his flight ring. Despite this, Phantom Girl still waits outside study hall for her friend to finish. Elsewhere as she awakens, Saturn Girl offers up the information that Tharok had deliberately fed them Legion dummy information to sow the seeds of a bigger plan via a psychic link. Clark contacts Brainy with information that the Coluan Manufactory was the real intended target and they had only wanted to create doubt and distrust in the Legion. They are quickly ambushed soon after realizing the truth. The team isn't whole yet, it needs Brainy to rejoin them and Phantom Girl bestows him with a flight ring. The battle is fought to a standstill, finally ending with Tharok ordering the Fatal Five to retreat - secretly a psychic nudge from Saturn Girl. Tharok appears and confronts Brainiac 5. He smirks that genius isn't something that can be downloaded. Brainiac admits he's learnt from Tharok's plan and bettered himself in the process. He can learn to be more of a person from his friends and team mates and for that, he's now grateful. Brainiac also points out that Tharok is a cyborg - part robot, prone to system crashes. Brainy uploads a shutdown program into Tharok and the authorities arrive to detain the Fatal Five. Phantom Girl and Brainy share a quiet heart to heart. The topic of Brainy's test score arises and he smiles wryly that he didn't want to know it. After all what would he learn from that? Story - 5: The device of self-doubt/angst in the story was very slight even to the scale of being much like the current run of Justice League of America. But here it's a done-in-one and really works. 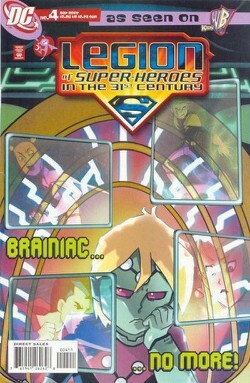 It offers an insight into Brainiac 5's life and his character. Similarly Phantom Girl is given the same chance offering her heart and personality, her interaction with Brainy in the story shows the team as a cohesive family unit rather than a gang that fights crime and hangs out in a giant trophy cabinet as its only reason for being. The worry for his friend makes Superman's involvement both touching and deeply humanising of him. Art - 5: Steve Uy's artwork on the covers has been a varied bag of 2-5's very hit and miss however to see it in action in sequential panelling is amazing. The pastel coloring gives the art that extra edge and the art looks exquisitely like an episode truly in print. The composition and detail is almost breath taking. Cover Art - 2: The cover really doesn't sell the book as well as it could have and it's almost heartbreaking as the interior is absolutely fantastic. It DOES depict the story and Brainiac 5's deep depression but there are so many levels to the story that could have been explored here.